Parenting in Christ | Why Not Train A Child? 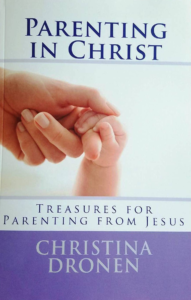 Parenting in Christ: Treasures for Parenting from Jesus is a new book, written by Christina Dronen. It is a lovely little study book, containing 10 short lessons, perfect for personal study or a small group setting. This is a very gentle book and respectful of children. I was quite impressed with these lessons and recommend the book highly.